Located across the street from a lovely park area, this 2 bedroom, 2 bath home with manicured garden has an open concept floorplan offering amazing living room views, fireplace, combo living/dining area, small den/office, beautiful laminate flooring, indoor laundry and beautiful deck patio perfect for entertaining in Avila Beach’s ambient microclimate area. Pluses are the approx. 13x15 workshop with bathroom & shower and approx. 16x21 garage that includes a new fire door and new firewall. There are a number of upgrades that include: Low-flow toilets, 40-gal. water heater, electrical upgrades, new paver patio & stone patio plus a fence renovation with the neighbor. There is also a separate storage shed. A security guard greets you and your guests at the main entrance gate. 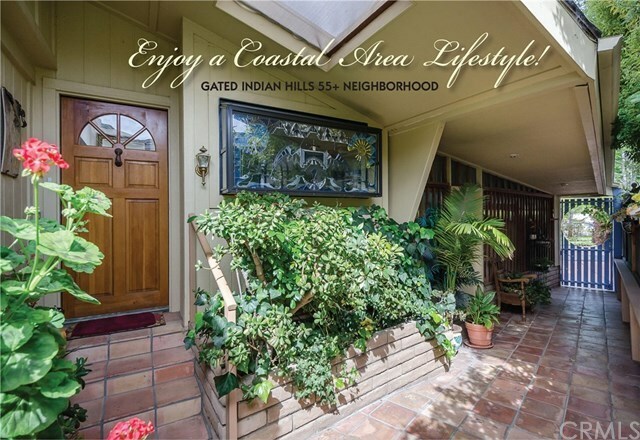 Indian Hills 55+ community is part of the master planned community of San Luis Bay Estates. Indian Hills has a pool, spa, private clubhouse with library, meeting room and card room plus sauna and game areas. Trails, golf & tennis club are nearby. HOA is $333 per month.